Representative Honours: Ireland: 9 Full Caps (1919-1929), 1 ‘Victory’ Cap (1919); Irish League: 2 Caps (1919). Club Honours: (with Linfield) Irish Cup Winner 1915/16, 1918/19; Co. Antrim Shield Winner; Belfast & District “War-Time” League Champion; (with Rangers) Scottish League Champion 1920/21, 1922/23, 1923/24, 1924/25, 1926/27, 1927/28, 1928/29, 1929/30. Billy McCandless began his career as a fifteen year-old in the North Belfast Combination winning the title in his first season. The medal, the first of 42 he won in his career, was worth half-a-crown (12½p) and remained one of proudest mementos. After a few years he signed for Ligoniel, where he won the Football Alliance before joining Intermediate League side, Barn. The Intermediate League featured the big Irish League sides’ reserve teams, and he was signed by Linfield in 1914. Through the years of the Great War McCandless claimed War-Time League titles and winner’s medals in the Irish Cup and Co. Antrim Shield. After the War ended he won his first ‘cap’ in the Victory International against Scotland in Glasgow and he won his first ‘full’ cap in Ireland’s first post-War match, a 1-1 draw with England. He also played twice for the Irish League in the immediate post-War period. Those early representative honours proved McCandless’ versatility as they were won variously at right-back, right-half as well as in the left-back role that would make him famous. It was a performance for Ireland in a 2-0 defeat by England in Sunderland that led to a number of mainland clubs chasing McCandless. Eventually it was Rangers that claimed his signature in a £2,500 deal, a record fee for an Irish player at that time. He spent ten years at Ibrox, many with another Irishman, Bertie Manderson as his full-back partner as Rangers dominated the Scottish League. In 1930 McCandless returned to Ireland where he was to take his first steps into management with Ballymena. In 1933 he moved back to Scotland to manage Dundee. Prior to his resignation in April 1937 he had dragged the Dees from minnows to challengers. In September 1937 he accepted the management post at Newport County, leading them to the 1938/39 Division Three (South) title. Highly regarded, it was written of him: "(his) advice is often sought abd seldom neglected. 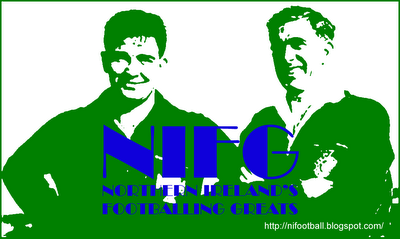 Knows football from beginning to end". After the Second World War the Newport side was decimated, and following disagreements with the board over the team’s future he resigned. A month later, in June 1946, he took charge of Cardiff City. In the first season at Ninian Park he again claimed the Division Three (South) title, but just three months into the following campaign he moved to manage Swansea Town. 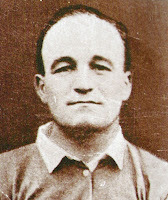 In 1948 he completed a unique treble, leading a third Welsh club to the Division Three (South) title. He remained boss at the Vetch Field until his death in the summer of 1955. A keen pigeon follower, his birds were a common sight at the grounds of every club he managed. Following his death the Western Mail printed the following obituary: “He was a man who lived for football and Welsh soccer has sustained a severe loss in the death of this Irishman who did so much for it. Billy Mac will be mourned by the soccer public everywhere”. Summary: 9/0. Won 0, Drew 3, Lost 6. I'm not aware of any link. If I find anything I'll post it up. Billy McCandles is my great uncle. He was my grandmother's ( Sarah McCandless ) brother. She came to the US in the 1920s. Billy McCandless had a brother John but he was younger and born around 1899 so I think the John McCandless your writing about is Billy's father who was John McCandless married to Matilda Eyre.